Tumors are complex ecosystems defined by spatiotemporal interactions between different cell types. Genomic alterations occurring in cancers cells, leading to oncogene activation and inactivation of tumor suppressor genes, represent the major mechanism of carcinogenesis and cancer progression. The knowledge based on these alterations has allowed the development of targeted therapies and therefore the improvement of prognosis in a significant number of cancer patients. More recently, the implication of host tumor microenvironment (TME) and, in particular, the implication of the tumor host immune system in the control of tumor progression has been demonstrated. Loss of anti-tumor immunity and development of escape mechanisms to immune effectors correlate with the aggressiveness of cancer. Therefore, it makes sense to target the microenvironment and/or manipulate the host immune system to eradicate tumors or to prevent their recurrence. Tumor heterogeneity affecting malignant and immune cells may explain that targeting of one deregulated cellular and signaling pathways most often fails to fully control tumor growth. To progress beyond the current stage of our knowledge, based on the development of innovative tools (single cells analysis), this integrated research program 2, will explore the heterogeneity of malignant cells and the host diversity in the tumor microenvironment. We also aim at analyzing dynamic interactions between tumor cells and the different cellular components of the tumor microenvironment. Our findings will constitute the rationale for the development and validation of novel composite prognostic and theranostic biomarkers, better reflecting the complexity of tumor and taking into account its heterogeneity. In the previous CARPEM program, we have extensively studied tumor heterogeneity, and provided new molecular prognosis classifications [Assié Nature Genet 2014, Marisa Plos Med 2013, Guinney Nature Med 2015, Letouze Cancer Cell 2013, Schulze Nature Genet 2015, Pilati Cancer Cell 2014]. We have also demonstrated the powerful impact of immune biomarkers derived from the tumor microenvironment, such as the immunoscore in colorectal cancer [Mlecnik Immunity 2016] or the profile of inhibitory receptors in renal cell carcinoma [Giraldo Clin Cancer Res 2015, Granier Cancer Res 2017] to predict the clinical outcome of patients. Finally, based on our complementary expertise, we have integrated the genetic and the immunological approaches and demonstrated an intimate relationships between molecularly defined tumor subgroups and the associated immune and stromal composition of the tumor microenvironment [Becht Clin Cancer Res 2016, Mansuet-Lupo 2016, Bindea Immunity 2016, Becht Adv Immunol 2016, Giraldo Clin Cancer Res 2016; Roussel Oncoimmunol 2017]. A novel classification of tumors results from this integrated strategy. Our published results led to the subclassification of several major tumor tuypes in no more than 4-5 subgroups. Nonetheless, we are aware of the fact that within these subgroups a huge heterogeneity exists. Based on these observations, we now aim at diving more deeply in the characterization of tumor heterogeneity by single cell analysis technologies and by using multiparametric approaches. Preliminary work from a CARPEM team deciphers that tumor heterogeneity at single cell level may allow identifying initiating events that govern the phenotype and hence prognosis [Chesnais et al, Blood 2017]. In addition, the intricate link between the molecular genetic subgroup of tumors and the immune landscape of tumor microenvironment convinced us about a potent crosstalk between tumor and immune cells shaping reciprocally the phenotype of these cells. The identification of the signaling pathways involved in this dialogue at epigenetic levels in mouse models, 3D organoid cultures (for solid cancers), or humanized scaffolds mimicking bone marrow niches (for hematological malignancies) will help to identify novel composite biomarker and therapeutic targets. We also feel that this integrated research program will elucidate novel resistance mechanisms to cancer therapy. Tumors are complex ecosystems defined by spatiotemporal interactions between different cell types. 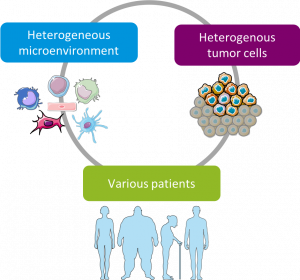 They are heterogeneous not only in the composition of tumor cells themselves with their sub-clonal evolution, but also in the composition of their immune infiltrate, a fact that is clinically relevant because it has a major impact on response/resistance equilibrium to treatments including common chemotherapies, targeted anti-cancer drugs and immunotherapy. Unraveling the complex interactions at a cellular level between genomic alterations in tumor cells and the tumor microenvironment is critical for understanding the natural history of cancer, for establishing prognosis and developing personalized treatment strategies. To illustrate this, we will take the example of colon cancer for which the medical need for prognostic markers is important. Indeed, cancers detected early (without spread beyond the organ of origin) are cured in their great majority of cases by surgery with rates of recurrence of 20 to 30%. Thus, apart from some particular clinical situations, there is no recommendation for adjuvant chemotherapy. In more advanced forms with lymph node invasion, adjuvant chemotherapy is recommended, although still 50% of the patients are cured by surgery only. As a result, 20-30% of the patients suffering from stage II colon cancer are under-treated, while 50% of patients in stage III are over-treated, calling for the establishment of accurate prognostic markers that avoid human suffering and curb high costs. We established the role of the immunoscore™ as a method to predict the prognosis of stage II and III in colon cancer (ASCO 2016 oral communication). We also demonstrated the role of molecular classifications as a prognostic marker for colon cancers, as validated in a large adjuvant randomized trial in colon cancer (ASCO 2017 oral communication). We showed a strong relationship between the molecular classification and the immune infiltration. Thanks to our national and international collaborations, as well as to the participation of several key opinion leaders in the field of colorectal cancer (J. Taieb, J. Galon, F. Pagès, H.W. Fridman, P. Laurent-Puig) in the CARPEM project, we are able to make a significant, perhaps revolutionary contribution to the management of patients with colon cancer. Among the new therapeutic strategies, immunotherapy has demonstrated to benefit to patients. 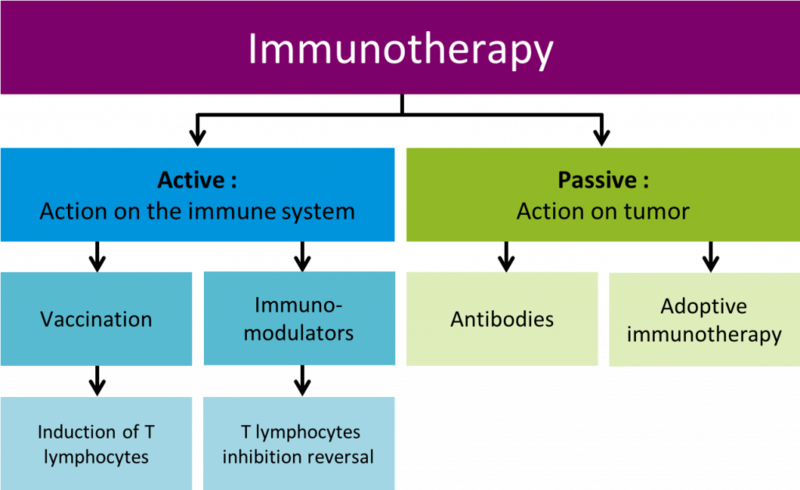 Cancer immunotherapy encompasses passive, active and immunomodulatory approaches. Passive immunotherapy involves administration of exogenously generated antibodies or adoptively transferred immune cells (typically T cells) that mediate tumor rejection directly. Active immunotherapy (i.e. vaccination) aims to eliminate cancer cells based through the activation of endogenous immune cells that recognize speciﬁc tumor-associated antigens (TAAs). The efficacy of immunomodulatory agents (lenalidomide, thalidomide…) may result from a direct antitumor activity on tumor cells, interference with tumor and stromal cells interaction and/or delivery of an immunomodulatory signal through the activation of cytotoxic T cells. This immunomodulatory signal may enhance immune response, via the reversal of immunosuppression, to increase endogenous anti-cancer immunity. The renewal of cancer immunotherapy is mainly rekindled by advances in adoptive T cell therapies and immune checkpoint inhibitors. These new therapeutic classes are major players in the arsenal of anticancer agents, helping to transform metastatic cancer disease into a chronic disease. Furthermore, some so called “immunogenic” chemotherapies (cyclophosphamide; oxaliplatin….) required the recruitment and involvement of tumor immunity for their clinical efficacy [Galluzzi Cancer Cell. 2015]. In most cancers, biomarkers justifying the use of immunotherapy are either still lacking or need optimization and validation in large cohorts of patients. In hematological malignancies, prognosis biomarkers are mainly based on the genetic characteristics of the leukemias at baseline and at the first evaluation after induction chemotherapy. We need to characterize the tumor and or the immune or non-immune microenvironment contributing to primary resistance to treatment, disease progression and relapse in order to refine the classification and optimize patient care. Medical needs encompass the integration of composite biomarkers emerging from multiparametric analyses of the tumor in the context of its microenvironment. Deciphering tumor heterogeneity as well as the complex interactions between malignant cells and their microenvironment at the single-cell level is the next frontier for improving cancer treatment. We aim at developing and validating innovative technologies and procedures for the characterization of cancer heterogeneity, thus tracking biomarkers of residual disease and treatment resistance. We will integrate pre-clinical animal models and analysis of human tumors to integrate the cooperation of immune response and genomic alterations in the development of a cancer. We will validate composite biomarkers for the prediction of prognosis, response to treatment and drug toxicities in large cohorts of patients.